30E 60E 90E 120E 150E 180 150W 120W 90W 60W 30W Fig. 1.33 Zonal section of salinity along 58.5° S (Southern Ocean). 30E 60E 90E 120E 150E 180 150W 120W 90W 60W 30W Fig. 1.34 Zonal section of potential density (kg/m3) along 58.5° S (Southern Ocean). the zonal density map are the strong density fronts associated with the major topographic features in the Southern Ocean. Since large-scale oceanic circulation should satisfy the geostrophy constraint, these meridional density fronts imply strong meridional velocity fronts in the Southern Ocean associated with these major topographic features. The lack of any meridional land barrier makes the establishment of a zonal pressure difference in this latitudinal band impossible. As a result, there would be no geostrophic current in the meridional direction if there were no bottom topography. However, the existence of major topographic features in the Southern Ocean induces some major, permanent, eddy-like features, which play an important role in the circulation at this latitudinal band. Motions in the world's oceans cover a tremendous range of spatial and temporal scales. These motions can be classified as turbulence, waves, and currents. At the small-scale (down to the order of millimeters) and high-frequency end of the spectrum, motions in the oceans can be classified as turbulence, surface and internal gravity waves. Although these motions also interact with the large-scale motions, many aspects of their study differ from that of large-scale dynamics; and therefore they are not the focus of this book. 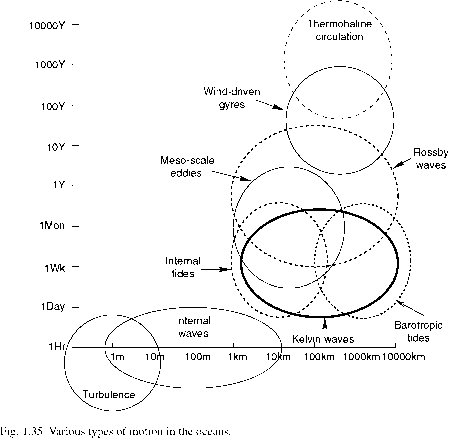 At the other end of the spectrum, there are large-scale (on the order of 1 km to 10,000 km) waves and currents, as shown in Figure 1.35. (Note that although internal waves can have a horizontal scale of more than 1 km, we do not include them among the large-scale motions discussed in this book.) These motions are further classified into four main categories. The study of tides is probably one of the most familiar branches of physical science. Mankind started to observe tidal motions at the beginning of civilization. In general, tidal motions involve spatial scales of the whole basin. 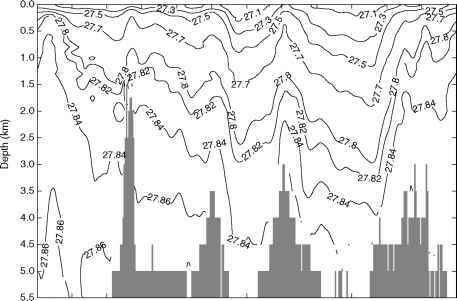 Owing to the complicated shapes of coastline and bottom topography, tidal motions can also involve spatial scales much smaller than basin-scale; however, such relatively small-scale motions are related to the basin-scale tidal motions in the open oceans. Although most components of the tides have a frequency on the order of a day, some components can have much longer periods, such as the annual and semi-annual solar tides. The theory of tidal motion is one of the oldest branches of dynamical oceanography. The modern theory of tidal motions started from the classical work of Newton's (1687) theory of equilibrium tides and Laplace's (1775) formulation of the tidal equation. Since tidal motions are primarily controlled by astronomical forces and the shape of coastline and seafloor, they can be considered nearly time-invariant for time scales shorter than centennial. In fact, tidal tables for the world's oceans have been printed for many years into the future. Large-scale and low-frequency waves These include Rossby waves and Kelvin waves, and they play a crucial role in the time evolution of the oceanic circulation. The major difference between these waves and the commonly encountered gravity waves is that these waves are characterized by the fact that the Earth's rotation is their restoring force. The existence of these waves can be detected either through satellite measurements or by in situ observations. These are the most energetic component of the oceanic circulation; 99 percent of the total kinetic energy in the oceans belongs to meso-scale (or synoptical scale) eddies, which can also be called geostrophic turbulence. They play an essential role in the energy cascade in the oceans. However, our knowledge about the meso-scale eddies in the oceans remains very incomplete because there are not enough data. Although satellite altimetry has provided a wealth of data for the surface expression of meso-scale eddies, observing the meso-scale eddies in the vast oceans remains a great challenge for technology. With the deployment of the Argo floats in the world's oceans, we may see much better data coverage in the near future. Quasi-steady current systems This category includes wind-driven circulation and thermohaline circulation. Large-scale motions in the oceans are organized into circulation systems, which are regulated by various forces. These circulation systems play an essential role in setting up the global environments and climate, and are the main focus of this book. It is very important to recognize that the oceanic circulation is a complicated dynamical system; thus, the separation into the above four categories of motion should be treated with caution because the differences between these different types of motion can be fuzzy. In fact, all these components interact in very complicated and nonlinear ways. It is a common practice to study the theories of individual components of the system; however, such theories should be combined with study about the interactions between the different components of the circulation system. By excluding motions associated with waves and eddies, large-scale flows in the oceans can be separated into three components: tidal flows, wind-driven circulation, and thermohaline circulation. Clearly, such a classification is somewhat subjective because there must be nonlinear interactions between these components. Since the theory of tidal motions, especially the barotropic tides, has been well established, we will confine our discussion here to the other two components. For example, circulation in the Atlantic Basin can be separated into three major parts: the wind-driven gyres in the upper ocean, the meridional overturning cells associated with deep/bottom water formation and spreading, and the Antarctic Circumpolar Current (ACC) system. North of 30° S, motions in the Atlantic Basin can be further separated into the following components. 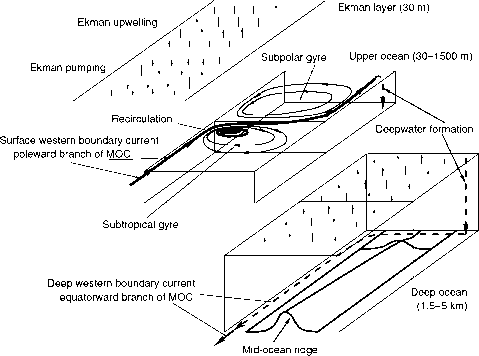 At the surface, there is the wind-stress-dominated Ekman layer, with wind-driven gyres below this layer. Motions at depths below the wind-driven gyres are typically classified as part of the thermohaline circulation (Fig. 1.36). The separation of wind-driven gyre and the thermohaline circulation is, of course, artificial; but such a separation can help us to simplify the problems and thus obtain a clear picture of the physical processes involved in each of these components. 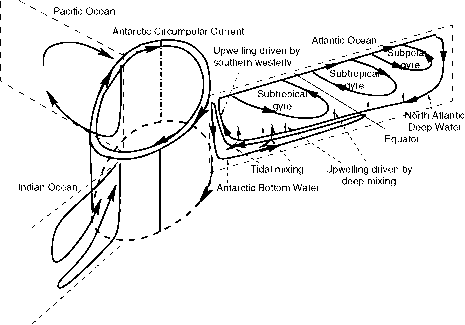 The Antarctic Circumpolar Current system is a complicated combination of both the wind-driven and thermohaline circulation. However, it does not appear as a horizontal gyre; instead, it is the only circum-Earth current in the world's oceans under the current geometric and climatic conditions. It plays a unique role as the global artery, feeding bottom water to the world's oceans and receiving water at intermediate levels from other oceans. Fig. 1.36 Schematic view of the circulation in the North Atlantic Ocean, including the subtropical wind-driven gyre, the subpolar wind-driven gyre, the recirculation, and meridional overturning cell (MOC) associated with the thermohaline circulation. in many fundamental ways. Table 1.1 shows some of the most essential characteristics of these two types of circulation. This simple table is not intended as an accurate description of the characteristics of the circulations; instead, it offers the reader concise, conceptual descriptions of these motions. The wind-driven circulation Wind-driven circulation generally refers to the circulation in the upper ocean 1 km) which is primarily driven by wind stress. Wind stress can drive horizontal circulation in a homogeneous ocean; thus, the existence of wind-driven circulation is independent of the surface thermohaline forcing. Assuming that the circulation is steady and transport in the bottom Ekman layer is negligible, the vertically integrated flow in the ocean interior should satisfy the Sverdrup constraint, which is defined more accurately in Chapters 2 and 4. The direction of meridional overturning can be flipped thermocline theory. However, the ventilated thermocline theory assumes some kind of background stratification which is presumably set up by thermohaline circulation external to the wind-driven circulation. In this sense, the so-called wind-driven circulation in a stratified ocean represents the combined results of both wind stress and thermohaline circulation. The wind-driven gyre is established through the westward propagation of Rossby waves. Since at mid latitude the first baroclinic mode takes about 10-20 years to cross the subtropical basins, wind-driven circulation can vary on decadal time scales. How well do we understand the wind-driven circulation? The circulation in the upper ocean has been observed over the past half-century. Since the wind-driven circulation varies on decadal time scales, there is now a major effort to assemble a large set of data which can provide useful insights into the variability of the wind-driven circulation. The wind-driven circulation theories discussed in this book form a collection of the developments over the past decades. These theories are mostly based on ideal-fluid models, and the roles of meso-scale eddies are omitted. Therefore, these theories can only provide some conceptual framework which can help us to understand the complicated circulation systems in the oceans. We will emphasize the development of the ventilated thermocline in the 1980s, which has provided the theoretical cornerstone for the theoretical framework of the modern theory of wind-driven circulation in the oceans. In particular, the models with multiple layers or continuous stratification provide a clear dynamical picture of the wind-driven gyres. Furthermore, the ideal-fluid thermocline theory can also be used as a convenient tool for understanding the variability of the wind-driven circulation in the upper ocean. The term thermohaline circulation has been widely used in oceanography and climate study. This term generally refers to the circulation associated with differences in temperature and salinity in the ocean, although the exact definition remains debatable, as will be explained shortly. g) the net export, by the North Atlantic Ocean, of a chemical substance such as the element protactinium. As it turns out, none of those definitions is suitable for describing the thermohaline circulation in the oceans. Thermohaline circulation is a circulation driven by mechanical stirring, which transports mass, heat, freshwater and other properties in the meridional/zonal direction. Mechanical stirring is supported by external sources of mechanical energy from wind stress and tidal dissipation. In addition, surface heat and freshwater fluxes are necessary for setting up the circulation. A more refined discussion about the thermohaline circulation will be presented in subsequent sections. • Is there a pure thermohaline circulation? Although surface thermohaline forcing alone may be able to drive the so-called pure thermohaline circulation, such a circulation is so weak that it is irrelevant to the circulation observed in the world's oceans. The meaning of this statement is implicitly included in the new definition discussed above, and this will be discussed in detail in connection with the energetics of the world's oceans and the thermohaline processes in the ocean. Common wisdom may suggest that oceanic circulation does not change with time; however, oceanic circulation does vary greatly over long time scales. There is evidence from paleoproxies that thermohaline circulation and the associated water mass formation/erosion has been through great changes on decadal to centennial and millennial time scales. • How well do we understand thermohaline circulation? The major problem associated with the thermohaline circulation is that it varies on time scales of centennial to millennial. Theories of oceanic circulation and numerical models need to be verified by observations. Thus far our understanding of thermohaline circulation under climate conditions different from the present comes mostly from incomplete sources, including paleoproxies, theories, and numerical simulations. It is clear that theories based on such an incomplete foundation are rudimentary. Despite the long-term efforts in collecting data for the circulation during the past, we do not have enough data to accurately describe thermohaline circulation under climatic conditions different from the present. This very unsatisfactory situation is due to the tremendously broad range in both temporal and spatial scales involved in the thermohaline circulation. The two types of circulation discussed above are combined together in the oceans. For example, the circulation system in the North Atlantic Ocean is shown in Figure 1.36. There are the wind-driven subtropical gyre and the subpolar gyre, and the strong surface western boundary currents associated with them. In addition, in the northwest corner of the subtropical gyre there is a regime of recirculation. Superimposed on these two gyre systems, there is the meridional overturning circulation (MOC), with a warm surface current moving across the equator and joining the surface western boundary current. At the boundary between the subtropical and subpolar gyres, they move eastward and turn northward in the eastern basin. This corresponds to the North Atlantic Current in the Atlantic Ocean. At the northeast corner, this current is cooled down and sinks, feeding the deep water. The deep water moves toward the western boundary, and from there it flows equatorward as the deep western boundary current. The Gulf Stream is a complicated current system that combines contributions from three major components in the upper ocean. The first contribution is due to the return flow of the linear Sverdrup dynamics, about 25 Sv. The second contribution is associated with the so-called recirculation. Due to the combination of eddies and bottom pressure torque, the volumetric flux of the recirculation is on the order of 100 Sv. The third contribution is due to the northward surface branch of the meridional overturning cell, which may contribute as much as 15 Sv. In the North Pacific Ocean, the meridional overturning cell is very weak or non-existent; thus the transport of the Kuroshio system does not include a significant contribution from the meridional thermohaline circulation. It is well known that oceanic circulation is driven by wind stress, heat flux, and freshwater flux associated with evaporation, precipitation, and river run-off. In addition, tidal dissipation also contributes. Although mankind started to observe the ocean circulation many centuries ago, the development of the modern dynamical theory of the oceanic circulation is relatively new. Thus far, our understanding of the oceanic general circulation remains rudimentary in comparison with the theory of atmospheric circulation, which has been developed to a much more complete stage during the last century. In his famous monograph about atmospheric general circulation, Lorenz (1967) reviewed the historical development of the relevant theory. The Hadley cell and the Jet Stream in both the Northern and Southern hemispheres characterize circulation in the atmosphere. In a crude way, the circulation in the atmosphere can be described in terms of an axisymmetric circulation. On the other hand, circulation in the oceans is much more complicated. Due to the existence of meridional boundaries associated with the major continents, individual basins are bounded by the coastlines. As a result, oceanic general circulation appears as separate gyres and meridional overturning cells in individual basins, with the only exception being that, under the modern geometry of land-sea distribution, there is a circum-Earth current system, the ACC, which resembles the circulation in the atmosphere. Fig. 1.37 Sketch of the circulation system in the Atlantic Basin, including three horizontal wind-driven gyres in the upper ocean, two meridional overturning cells, the Antarctic Circumpolar Current; the corresponding circulation details in the Pacific and Indian Oceans are omitted. each basin create the east-west pressure gradient, and thus make the existence of meridional geostrophic currents in each basin possible. As an example, a sketch of the circulation in the Atlantic Basin, including the ACC, is depicted in Figure 1.37. A more comprehensive review of the general circulation in the world's oceans can be found in the excellent monographs by Schmitz (1996a, b). The circulation system in the Atlantic Basin is a combination of meridional cells and horizontal gyres. There are three major gyres in the upper ocean: a subtropical gyre and a subpolar gyre in the North Atlantic Ocean, plus a subtropical gyre in the South Atlantic Ocean. The existence of these gyres is primarily due to wind stress on the ocean, and the structure of these gyres is the main focus of the wind-driven circulation theory. There are also small tropical gyres near the equator, but they are less well defined, so we will not discuss them here. There are two major meridional overturning cells in the Atlantic Ocean -the main cell associated with the NADW and a deep cell associated with the AABW. In the traditional theory of thermohaline circulation, these two cells are considered to be driven by NADW and AABW respectively. As will be explained later, however, deepwater formation cannot provide the mechanical energy required for sustaining the circulation against friction and dissipation. In fact, strong upwelling driven by the Southern Westerlies and deep mixing driven by tidal dissipation, as depicted in Figure 1.37, are the most important mechanisms sustaining the thermohaline circulation. Finally, the ACC is a combination of the wind-driven circulation and the thermohaline circulation; it is the global artery and plays the most critical role in the global oceanic circulation and climate. The dynamical structure of the ACC and its maintenance are rather complicated. In simple words, this current system is a result of the interaction between the wind-driven circulation and the thermohaline circulation. Our knowledge about the oceanic circulation has evolved at a rather slow pace, due to the difficulties in observing the oceanic general circulation, a turbulent system with extremely broad spatial and temporal scales. Although we have seen great progress in understanding the structure of the global oceans, many essential aspects of this global picture remain unclear, and it is one of the most crucial and exciting research frontiers. In the early stages, our knowledge of oceanic general circulation was mostly observational. The Oceans, written by Harald Sverdrup, Martin Johnson, and Richard Fleming (Sverdrup et al., 1942) is one of the classic books on oceanography. An historical article on oceanic circulation was written by Henry Stommel (1957), in which he summarized the theories of oceanic circulation at that time. During the past 50 years there have been many major breakthroughs in the theory of oceanic general circulation, and the following account is a concise history of modern theories of large-scale dynamical oceanography. The main thermocline is one of the most outstanding features in the world's oceans, and it can be easily identified from hydrographic sections. In this section, the climatology of Levitus et al. (1998) is used to diagnose the thermal structure in the world's oceans. 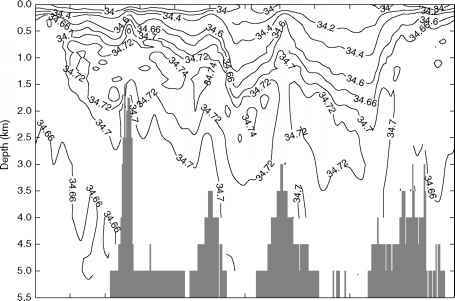 As an example, the structure of both temperature and density for the upper ocean along 158.5° E is shown in Figure 1.38. By definition, the thermocline is a thin layer where the vertical gradient of temperature is a local maximum. There are many types of thermocline, including the diurnal thermocline, the seasonal thermocline, the main thermocline, and the abyssal thermocline. The diurnal thermocline exists in the top layer of the upper ocean, and it is closely related to the diurnal cycle. The seasonal thermocline exists in the upper hundred meters of the ocean, and is closely related to the seasonal cycle in the upper ocean. The main thermocline exists within the depth range of 100-800 m. Because it is far away from the sea surface and shielded from the direct forcing in the seasonal cycle, it is also called the permanent thermocline. The abyssal thermocline exists in the deep ocean, which will be discussed in Section 5.2, which is concerned with deep circulation.